For generations, people in Japan have celebrated New Year's Day by sending specially designed cards — nengajō — to each other. As part of the tradition, postal workers store all the nengajō that are mailed in the final weeks of the old year, and then deliver every single one on New Year's Day. Many nengajō mark the Chinese Zodiac by depicting the animal of the year. 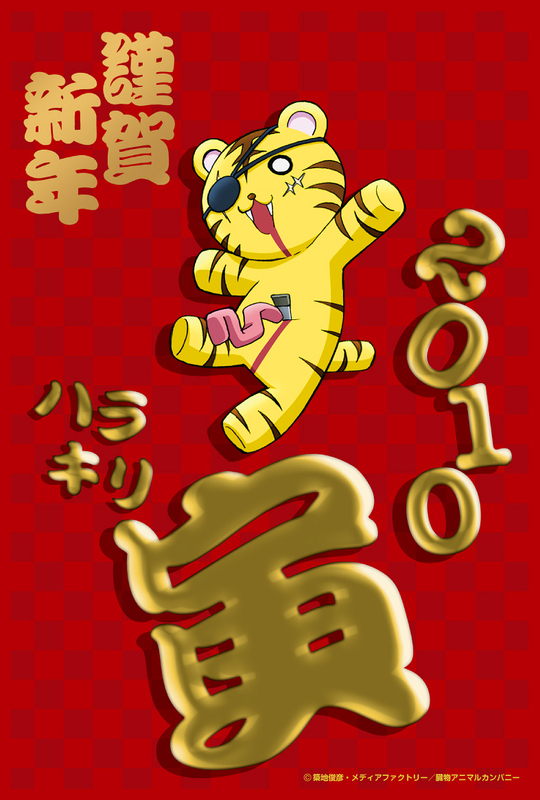 (In 2010, that animal is the tiger.) Here are some New Year's (and Christmas) greetings from the folks that will be bringing you anime and manga in the new year. Thanks to 4nBlue for the tip! This image is also available as personal computer wallpaper on the company's website. This image is also available as personal computer wallpaper on Flex Comix's website. © Copyright Ishimori Production Inc. Thanks to trunkschan90 for the tip! This image is available on Club Sunday's website. (In the linked page, verify your age and select the image at right to download personal computer wallpaper for seven different elf titles.) Update: Elf has since removed the wallpaper download links. Thanks to 4nBlue and sailorsean for the tips! Himaruya also posted nearly two dozen Christmas-themed images upon request from fans. Thanks to Bluesnow and neocloud9 for the tips! Thanks to kenshin77 for the tip! Thanks to Ari-chan for the tip! The Harakiri-Tora nenga image is available for downloading. Thanks to GlobalsoftPirka for the tip! This is the advertisement for Lump of Sugar's booth at the Comic Market 77 convention. Thanks to JaQiLinOtaku for the tip! © Nōgyō Musume! Project This image is also available as personal computer wallpaper on the company's website. © 2009 San-X Co., Ltd. Thanks to Tanbishugi for the tip! Thanks to Tratious for the tip! Thanks to Akkhima for the tip! Thanks to Youal for the tip! Thanks to Pia for the tip! There are many more anime/manga nengajō out there, so if you know of one we've missed, feel free to let us know in our forums or by email (newsroom at animenewsnetwork.com). Akemashite Omedetō Gozaimasu! Kisa image © 2004 Natsuki Takaya/HAKUSENSHA • TV TOKYO • NAS • Fruba Project. Licensed by FUNimation® Productions, Ltd.
Update: Kyoto Animation (The Vanishment of Haruhi Suzumiya), Nakaba Suzuki (Kongoh Bancho), Nao Yazawa ( Wedding Peach ), Mine Yoshizaki (Keroro Gunsō/Sgt. Frog) added. Update 2: Cyborg 009, Yuna Kagesaki, Kazuya Minekura, San-X added. Update 3: Hidekaz Himaruya, Weekly Shonen Sunday, Monthly Shonen Sunday , Club Sunday added. Update 4: AIC, Alice Soft, Caramel Box, Gainax's second image, Lump of Sugar added. Update 5: Age, Kämpfer, Lass, MinatoSoft, Yana Toboso added. The adult game makers Axl, Overdrive, and Propeller also posted nenga images. Thanks, 4nBlue! Update 6: Idea Factory, J-List, Nōgyō Musume! (Agri-Girl!) , Nozomu Tamaki, Jun Tsukasa added. Update 7: Kohime Ohse, Michiro Ueyama, Rco Wada, Kenichi Yoshida added. Studio Paper also posted a New Year's picture. Update 8: Keiji Asakawa, Detective Conan, Haruaki Katoh, Zettai Karen Children added. The CG Teiten Kansoku website has posted a comprehensive listing (mirror site) of New Year's greetings from Japanese computer-graphics artists.